I’ve covered reducing inflammation with smoothies in another article (click here to read) and won’t rehash everything here. Suffice it to say the recipe below is the best anti-inflammatory smoothie I could create based on my current knowledge. 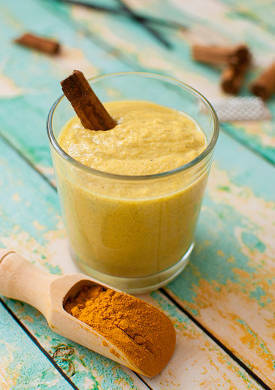 For another popular anti-inflammatory recipe, see my Spicy Anti-Inflammatory Smoothie. Before we get to the recipe I want to present my findings on alleviating psoriasis. This is something I don’t have personal experience with, but have been affected by a similar skin condition, eczema. If I had psoriasis here’s how I would address it. Some of these things I do anyways as part of living a healthy lifestyle. Sunlight: Many people have found relief from psoriasis from the sun’s rays. Perhaps the most critical reason for getting sun exposure is to maximize your Vitamin D levels. It seems more and more studies are showing just how important Vitamin D is to your overall health. You want to be mindful and not overdo it to the point of burning your skin. If you use sun screen, find an organic one that’s not loaded with chemicals. Water: This is perhaps the easiest thing you can do – drink water. Staying hydrated will help prevent your skin from getting too dry, which you want to avoid when you have psoriasis. Stress: Reducing stress has been shown to keep psoriasis flare ups under control. There are many stress reducing options including meditation, massage, and yoga. Nutritional Supplements: The omega-3 fatty acids found in fish oil have been shown to benefit people with psoriasis by reducing overall inflammation. Other supplements people have found relief from include vitamin D (via sunlight is preferred), vitamin B12, selenium, milk thistle, and evening primrose oil. Consult a medical professional before taking a supplement. Diet: Consuming a healthy diet is important. Eat a variety of fruits and vegetables, good fats, clean protein and little or no processed foods. Incorporate cold water fish rich in omega-3 such as salmon, herring, tuna, and mackerel into your diet. Going gluten-free is an option – some have found it triggers their psoriasis. Weight: There’s a link between being overweight and psoriasis. For weight loss smoothies and my take on an overall weight loss plan, see my Smoothie Weight Loss Guide. Topical Care: These natural remedies can provide relief when applied topically: aloe vera, apple cider vinegar, dead sea salt or Epsom salt baths, oats via paste or bath, colostrum, and tea tree oil. Again, consult a medical professional before using any of these as some might not play nice with prescribed medications. The amount of things you can do to tackle psoriasis may seem overwhelming. Don’t try to do everything at once. Pick the one or two things that call to you and start there. The key anti-inflammatory ingredient in this smoothie is turmeric, which can be used in other smoothies and dishes. Use it liberally. Enjoy! I would love to know if you try this psoriasis suppressing smoothie or your experience with psoriasis. How have you found relief? Please leave a comment below. Happy Blending! Hello,I am going to try your smoothie for psoriasis and would like to know how many I should drink a day?Thank you.I have it on my hands and feet.Very painful.Sure hope this helps. Consume this smoothie once a day, preferably for breakfast. Hope it helps, Lynda. That’s awesome, Joanne! I know how difficult skin issues are to treat as someone who’s had bouts of eczema over the years. My psoriasis calmed down tremendously after cutting gluten and sugar from my diet. Those are both common culprits. Great smoothie Ryan! I’m letting a co-worker who has psoriasis know about this smoothie!! Thanks again for ALL the great smoothie recipes & your articles! You’re welcome, Trish! I hope you co-worker finds some relief. Will never be with out this recipe. Often I used coconut water instead of green tea . Fantastic, Patti! Thanks for sharing your success which will certainly inspire others. Just read your juice recipe. But last four days I used to prepare juice extract carrot,green apple and cucumber after blend with baby spinach. Good result. All reddish conditions calm down and scaly production off. Also I will try your juice smoothie. Thanks for your sharing and help to people to defeat psoriasis. You’re welcome and thanks for sharing your success, Louis. I am undergoing Ayurvedic treatment for psoriasis since 5 years but I am not able to cure it. Please help me with this. It’s spreading all over my body . It has covered my back, thighs, legs and stomach. The information and smoothie above is the best advice I have to offer, Raavi. you need to add some black pepper to your turmeric. according to studies it increases the bioavailability 2000%. Good point, John. I didn’t want to scare people away as black pepper isn’t a typical smoothie ingredient.